AUSTIN, Texas – AMD announced a $100,000 landscape restoration grant for the Lady Bird Johnson Wildflower Center at The University of Texas at Austin during opening ceremonies Monday for AMD’s new “Lone Star” campus in Austin. The grant supports research to identify cost-effective ways of maintaining the ecological health of Texas grasslands. The funds are part of AMD’s $3 million commitment to preserving open space in Central Texas. 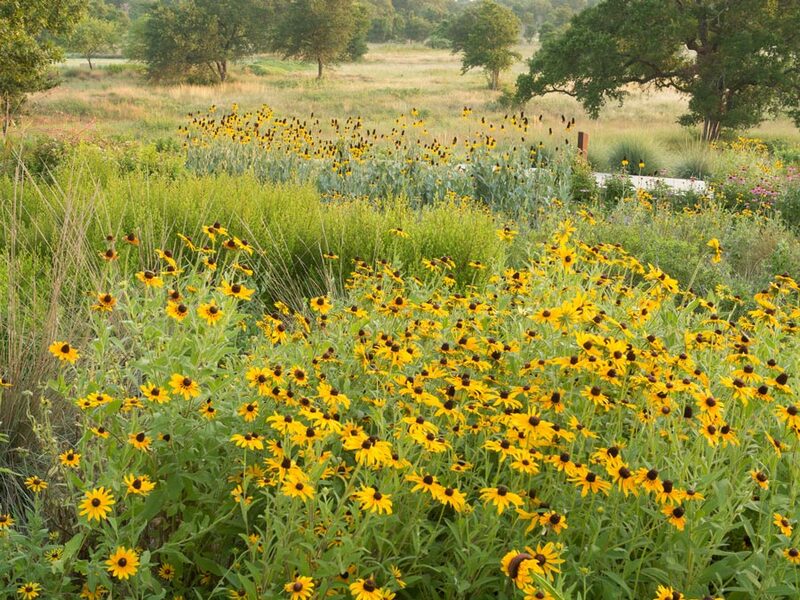 The Wildflower Center funds support a research project about the use of fire and other natural, economical ways to restore the health of rangelands comprising most of Texas’ open space. “Private landowners oversee more than 90 percent of undeveloped lands in Texas, said Dr. Steve Windhager, director of landscape restoration at the university’s Lady Bird Johnson Wildflower Center. “It’s important that we provide rangeland managers with effective tools for maintaining and restoring the health of these lands, which are a huge part of the state’s identity and ecological health,” he said. Grasslands in Texas are often used for raising livestock, which can overgraze and alter the health of the land when they aren’t properly managed. Once degraded, these lands are not only less valuable for livestock, but also have reduced water quality and habitat for wildlife. Using about 80 acres of land at the Wildflower Center, Windhager, Dr. Mark Simmons, and other Center staff will use the funds for the next two years to continue the long-term study that examines how prescribed fire during different seasons and other maintenance methods can be used to manage the ecology and biodiversity of Central Texas. The effects of these treatments can be seen firsthand along a one-mile interpreted trail at the center. This project, which received previous funding from the J. Robert Jr. and Helen Kleberg Foundation, has already produced compelling results. Simmons, Windhager and colleagues published findings in December 2007 demonstrating that they could reduce the amount of King Ranch Bluestem (a non-native, invasive grass) using prescribed burns during the grass’ summer growing season. Techniques such as summer fire also show signs of improving overall rangeland health, which benefits urban and rural Texans by reducing the risk of uncontrolled wildfires and improving seepage of water into underground aquifers. “We are providing the knowledge on how best to take advantage of historical maintenance methods that rangelands are already adapted to experiencing,” said Simmons, “because it’s clear that these processes that previously kept rangelands healthy still have relevance today, not only for rural areas but particularly for the health and sustainability of cities like Austin.